Native American Symbols, like the Journey symbol, can vary in meaning from one tribe to another and across the culture groups of North America. Discover facts and information about the meanings of secret and mysterious symbols used by Native American Indians in our List of Symbols including the Journey symbol. 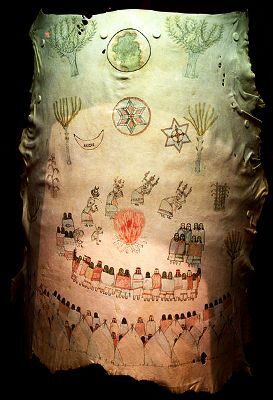 Native American Indians were a deeply spiritual people and they communicated their history, thoughts, ideas and dreams from generation to generation through Symbols and Signs such as the Journey symbol. Native American symbols are geometric portrayals of celestial bodies, natural phenomena and animal designs. The meaning of the horse symbol was to signify a journey, usually a journey home. The Native Indian Horse was a great wonder to the Native American Indians when it was first introduced by the Europeans in the 1500's and 1600's. Until this point the indigenous population had lived the life of a Stone Age man. The horse was at first referred to by the Native American Indians as the “God Dog” or “Big Dog”. The horse and rider team were seen as a godlike being and were extremely powerful. 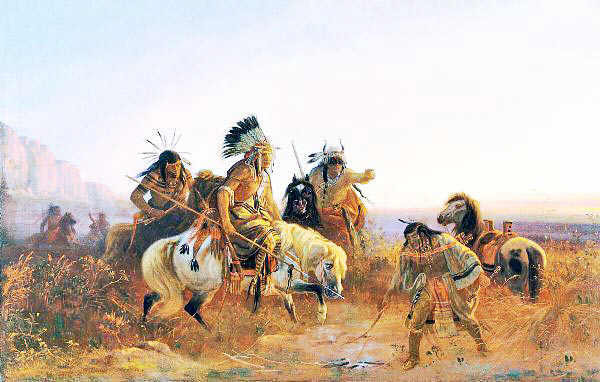 The introduction of the horse gave the Indians the freedom to travel and hunt in an easier way. They were able to undertake longer journeys to seek buffalo and their tribes prospered. Also refer to War Paint and Horse War Paint. The Journey symbol is in a fact a pictogram. A pictogram, also called a pictograph, conveys a story and meaning through pictures that signify and resemble the shapes of physical objects or people. An Ideagram is another form of pictogram which conveys complex ideas, feelings and emotions. A pictogram, such as the one recognised as a Journey symbol, is a therefore a form of writing which uses representational, pictorial drawings to tell a story. The religion of Native Americans was dominated by rituals and belief in a spiritual connection with nature and these beliefs were reflected in the various symbols and pictograms they used such as the Journey symbol. Native Indian symbols are still used as Tattoos and were used for a variety of reasons and depicted on numerous objects such as tepees, totem poles, musical instruments, clothes and War Paint. Indian Tribes also used their own colors for symbols, refer to Color Meanings & Symbolism, and designs depending on the natural resources available to make Native American paint. His belongings was decorated with art and included symbols depicting his achievements, acts of heroism, his various spirit guides or the most important events in his life and included the Journey symbol or pictogram. Every symbol used by an American Native Indian had meaning which can be accessed from Symbols and Meanings. Journey. Discover the vast selection of pictures which relate to the History of Native Americans and illustrate many symbols used by American Indians. The pictures show the clothing, war paint, weapons and decorations of various Native Indian tribes that can be used as a really useful educational history resource for kids and children of all ages. We have included pictures and videos to accompany the main topic of this section - Journey. The videos enable fast access to the images, paintings and pictures together with information and many historical facts. All of the articles and pages can be accessed via the Native Indian Tribes Index - a great educational resource for kids.